Official result is yet to be declared. A constitutional referendum was held throughout Turkey on 16 April 2017 on whether to approve 18 proposed amendments to the Turkish constitution that were brought forward by the governing Justice and Development Party (AKP) and the Nationalist Movement Party (MHP). If approved, the office of the Prime Minister would be abolished and the existing parliamentary system of government would be replaced with an executive presidency and a presidential system. The number of seats in Parliament were proposed to be raised from 550 to 600 while the president was proposed to be given more control over appointments to the Supreme Board of Judges and Prosecutors (HSYK). The referendum was held under a state of emergency that was declared following a failed military coup attempt in July 2016. Early results indicated a 51–49% lead for the “Yes” vote. The Supreme Electoral Council allowed non-stamped ballots to be accepted as valid. The main opposition parties decried this move as illegal, claimed that as many as 1.5 million ballots were unstamped, and refused to recognize the results. The electoral board has stated that the official results might be declared in 11 to 12 days. Recep Tayyip Erdoğan, the incumbent President of Turkey. An executive presidency has been a long-standing proposal of the governing AKP and its founder, the current Turkish President Recep Tayyip Erdoğan. 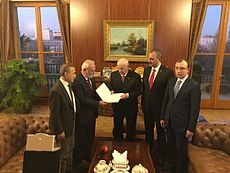 In October 2016, the Nationalist Movement Party (MHP) announced its co-operation for producing draft proposals with the government, with the combined support of both AKP and MHP MPs being sufficient to put forward the proposals to a referendum following a parliamentary vote in January. Those in favour of a “Yes” vote argued that the changes were necessary for a strong and stable Turkey, arguing that an executive presidency would bring about an end to unstable coalition governments that had dominated Turkish politics since the 1960s up until 2002. The ‘No’ campaign have argued that the proposals would concentrate too much power in the hands of the President, effectively dismantling the separation of powers and taking legislative authority away from Parliament. Critics argued that the proposed system would resemble an ‘elected dictatorship’ with no ability to hold the executive to account, leading effectively to a ‘democratic suicide’. Three days before the referendum, one of Erdoğan’s aides called for a federal system should the ‘Yes’ vote prevail, causing a backlash from the pro-Yes MHP. Both sides of the campaign have been accused of using divisive and extreme rhetoric, with Erdoğan accusing all ‘No’ voters of being terrorists siding with the 2016 failed coup plotters. The campaign was marred by allegations of state suppression against ‘No’ campaigners, while the ‘Yes’ campaign were able to make use of state facilities and funding to organise rallies and campaign events. Leading members of the ‘No’ campaign, which included many high-profile former members of the MHP such as Meral Akşener, Ümit Özdağ, Sinan Oğan and Yusuf Halaçoğlu were all subject to both violence and campaign restrictions. The ‘Yes’ campaign were faced with campaigning restrictions by several European countries, with the German, Dutch, Danish and Swiss governments all cancelling or requesting the suspension of ‘Yes’ campaign events directed at Turkish voters living abroad. The restrictions caused a sharp deterioration in diplomatic relations and caused a diplomatic crisis between Turkey and the Netherlands. Concerns were also raised about voting irregularities, with ‘Yes’ voters in Germany being caught attempting to vote more than once and also being found to have been in possession of ballot papers before the overseas voting process had started. A ballot paper and envelope used in the referendum. ‘Evet’ translates to Yes while ‘Hayır’ translates to No. Introducing a presidential system was proposed by then-Minister of Justice Cemil Çiçek and backed by then-Prime Minister Erdoğan in 2005. Since then, presidential system has been openly supported by Justice and Development Party leaders several times, along with a “new constitution”. Justice and Development Party vice-president Hayati Yazıcı proposed April 2017 as a date for the referendum. On 10 December 2016, the AKP and MHP brought forward 21 proposed amendments to the constitution and began collecting signatures from MPs in order to begin the parliamentary procedures for initiating a referendum. After Assembly Commission talks, 3 proposals were withdrawn, leaving 18 amendments remaining. The full-text proposal in Turkish and the present Turkish constitution are found at the following links. The most important changes have been highlighted by the Union of Turkish Bar Associations. An English-language summary and interpretation of the 18 amendments is listed in the table below. 1 Article 9 The judiciary is required to act on condition of impartiality. 2 Article 75 The number of seats in the Parliament is raised from 550 to 600. 3 Article 76 The age requirement to stand as a candidate in an election to be lowered from 25 to 18, while the condition of having to complete compulsory military service is to be removed. Individuals with relations to the military would be ineligible to run for election. 4 Article 77 Parliamentary terms are extended from four to five years. Parliamentary and presidential elections will be held on the same day every five years, with presidential elections going to a run-off if no candidate wins a simple majority in the first round. Discuss, increase or decrease budget (on Budget Commission) and accept or reject the budget on General Assembly. 5 Article 89 To overcome a presidential veto, the Parliament needs to adopt the same bill with an absolute majority (301). 6 Article 98 Parliament now detects cabinet and Vice President with Parliamentary Research, Parliamentary Investigation, General Discussion and Written Question. Interpellation is abolished and replaced with Parliamentary Investigation. Vice President needs to answer Written Questions within 15 days. 7 Article 101 In order to stand as a presidential candidate, an individual requires the endorsement of one or more parties that won 5% or more in the preceding parliamentary elections and 100,000 voters. The elected president no longer needs to terminate their party membership if they have one. 8 Article 104 The President becomes both the head of state and head of government, with the power to appoint and sack ministers and Vice President. The president can issue decrees about executive. If legislation makes a law about the same topic that President issued an executive order, decree will become invalid and parliamentary law become valid. 9 Article 105 Parliament can open parliamentary investigation with an absolute majority (301). Parliament discusses proposal in 1 month. Following the completion of Discussion, Parliamentary investigation can begin in Parliament with a hidden three-fifths (360) vote in favor. Following the completion of investigations, the parliament can vote to indict the President with a hidden two-thirds (400) vote in favor. 10 Article 106 The President can appoint one or more Vice Presidents. If the Presidency falls vacant, then fresh presidential elections must be held within 45 days. If parliamentary elections are due within less than a year, then they too are held on the same day as early presidential elections. If the parliament has over a year left before its term expires, then the newly elected president serves until the end of the parliamentary term, after which both presidential and parliamentary elections are held. This does not count towards the President’s two-term limit. Parliamentary investigations into possible crimes committed by Vice Presidents and ministers can begin in Parliament with a three-fifths vote in favor. Following the completion of investigations, the parliament can vote to indict Vice Presidents or ministers with a two-thirds vote in favor. If found guilty, the Vice President or minister in question is only removed from office if their crime is one that bars them from running for election. If a sitting MP is appointed as a minister or Vice President, their parliamentary membership will be terminated. 11 Article 116 The President and three-fifths of the Parliament can decide to renew elections. In this case, the enactor also dissolves itself until elections. 12 Article 119 The President’s ability to declare state of emergency is now subject to parliamentary approval to take effect. The Parliament can extend, remove or shorten it. States of emergency can be extended for up to four months at a time except during war, where no such limitation will be required. Every presidential decree issues during a state of emergency will need an approval of Parliament. 13 Article 125 The acts of the President are now subject to judicial review. 13 Article 142 Military courts are abolished unless they are erected to investigate actions of soldiers under conditions of war. 13 Article 146 The President used to appoint one Justice from High Military Court of Appeals, and one from the High Military Administrative Court. As military courts are abolished, the number of Justices in the Constitutional Court reduced to 15 from 17. Consequently, presidential appointees reduced to 12 from 14, while the Parliament continues to appoint three. 14 Article 159 Supreme Board of Judges and Prosecutors is renamed to “Board of Judges and Prosecutors”, members are reduced to 13 from 22, departments are reduced to 2 from 3. 4 members are appointed by President, 7 will be appointed by the Grand Assembly. Supreme Board of Judges and Prosecutors (HSYK) candidates will need to get 2/3 (400) votes to pass first round and will need 3/5 (360) votes in second round to be a member of HSYK. (Other 2 members are Justice Minister and Ministry of Justice Undersecretary, which is unchanged). 16 Article 123 President gets power to create States. 17 Temporary Article 21 Next presidential and General elections will be held on 3 November 2019. If Grand Assembly decides early elections, both will be held at the same day. Board of Judges and Prosecutors elections will be made within 30 days of approval of this law. Military courts will be abolished once the law comes into force. 18 Applicability of amendments 1-17 The amendments (2, 4 and 7) will come into force after new elections, other amendments (except temporary article) will come into force once newly elected president is sworn in. Annulled the article which elected Presidents forfeit membership in a political party. This constitutional amendment will be voted in a referendum as a whole. Jump up^ This increment ratio is defined by Ministry of Finance and determines changes on absolute-valued taxes and fines. After being signed by the AKP’s 316 MPs, the 21 proposed changes were submitted to the Speaker of the Grand National Assembly and were then referred to the Parliamentary Constitutional Commission. The Parliamentary Constitutional Commission, headed by AK Party MP Mustafa Şentop, began scrutinising the proposals in December 2016, earlier than the planned date of January 2017. The Constitutional Commission is formed of 25 Members of which 15 are from the AKP, 5 are from the CHP, 3 are from the HDP and 2 are from the MHP, as per the composition of parliament. Since the AKP held a large majority of the commission’s seats, it was expected by media commentators that there would be minimal surprise developments at the scrutiny stage. Debates in the commission were heated, with occasional fights being observed between MPs. The Constitutional Commission has the power to amend or reject the proposed changes before they are put to a vote for all MPs. The Commission made minor changes to numerous proposals, such as raising the number of members of the Supreme Board of Judges and Prosecutors from 12 to 13. So far, the commission has rejected three of the 21 proposed changes, reducing the constitutional package from 21 proposals to 18. The 5th proposal, which created ‘reserve MPs’ to take the parliamentary seats that fall vacant between elections, was controversially rejected with just three signatures, well short of the support of 25 commission members or 184 total MPs necessary. It was reported that AKP MPs opposed the creation of ‘reserve MPs’ on the grounds that it threatened the security of sitting MPs by incentivising reserves to incapacitate them in order to take their seat. The 15th proposal that gave the President the right to structure the civil service and state institutions through executive decrees was also rejected. A day later on 29 December, the 14th proposal which gave the right for the President to appoint senior bureaucratic officials was rejected. The Commission completed the approval process on 30 December, rejecting 3 of the 21 proposals in total. Following the completion of the Constitutional Commission hearings, the 18 proposals were presented to parliament for ratification. Constitutional amendments need a three fifths majority (330 votes) to be put forward to a referendum and a two-thirds majority (367 votes) to be ratified directly. Justice and Development Party (AKP) officials claimed before the vote that even if the 367-threshold was reached, the government would not ratify the changes without a referendum. Parliament voted on each of the 18 proposals separately in two rounds. The first round served as an indicator of whether the amendments would gather sufficient support, with amendments being proposed by all parties present in the chamber. In the second round, parties are no longer permitted to propose changes to the proposals. The results of the second round are taken into account, with 330 votes needed to send them to a referendum or 367 for direct implementation. A final vote on all of the approved proposals at large, with the same thresholds, was undertaken at the end of the second round, with the entire process being disbanded if votes in favour fell below 330. Of the total 550 Members of Parliament, 537 were entitled to a vote. 11 MPs from the Peoples’ Democratic Party (HDP) were under arrest for terrorism charges and were unable to partake in the vote, with the remaining 48 HDP MPs boycotting the vote after their motion calling for the arrested MPs to be brought to parliament to vote was rejected. The Parliamentary Speaker İsmail Kahraman, who is unable to take part in the vote by virtue of being the Speaker, was hospitalised during the vote, meaning that AKP deputy speaker Ahmet Aydın presided over the proceedings and was therefore unable to cast a vote. Of the 537 MPs eligible to vote, the AKP held 315, the CHP 133, the MHP 39, the HDP 48 and 2 were independent. Of the MHP’s 39 MPs, 6 had openly stated that they would vote against the amendments, leaving the total number of MPs expected to vote ‘Yes’ at 348. The CHP’s 133 MPs and the two independents, which consisted of Aylin Nazlıaka and Ümit Özdağ, voted ‘No’ while the HDP boycotted the votes. Parliamentary voting began on 9 January, with the first round of voting being completed on 15 January. Opposition politicians criticised the rushed way in which the votes were conducted, with four to five votes taking place in a day with no adjournments. The votes were marred by numerous irregularities, with CHP Members of Parliament filming AKP MPs openly casting their vote or intimidating uncertain MPs to vote ‘Yes’. The Minister of Health, Recep Akdağ, was filmed casting an open vote, which is disallowed by the constitution, and openly admitting that he had committed a crime afterwards. AKP MPs responded to attempts to film them with hostility, with fights occasionally breaking out between government and opposition MPs. CHP MP Fatma Kaplan Hürriyet was allegedly strangled by AKP Parliamentary Group Leader Mustafa Elitaş after she filmed Elitaş and Prime Minister Binali Yıldırım casting open votes. Several MPs were hospitalised, while the podium where MPs rose to make speeches was dislocated with one of its €15,000 microphones being reported as missing. The second round of voting was completed on 20 January, with all of the proposed amendments being approved. A final motion to enact the approved amendments was approved by 339 votes, surpassing the 330-vote threshold to hold a referendum but falling short of the 367-vote threshold needed to enact the amendments directly. Several[clarification needed] AKP MPs voted openly for the changes, violating the constitutional requirement of a secret vote. The amendments were received with heavy criticism from opposition parties and non-governmental organisations, with criticism focusing particularly on the erosion of the separation of powers and the abolition of parliamentary accountability. Constitutional legal experts such as Kemal Gözler and İbrahim Kaboğlu claimed that the changes would result in the Parliament becoming effectively powerless, while the executive president would have controls over the executive, legislative and judiciary. On 4 December, the Atatürkist Thought Association (ADD), Association for the Support of Contemporary Living (ÇYDD) and the Trade Union Confederation held a rally in Ankara despite having their permissions revoked by the Governor of Ankara, calling for a rejection of the executive presidential system on the grounds that it threatened judicial independence and secular democratic values. The amendments were initially received with mixed responses from the opposition CHP, which have long been critical of the AKP’s constitutional plans. Shortly after the proposals were made public and submitted to Parliament on 10 December, Prime Minister Binali Yıldırım reported that the CHP was in agreement with 5 of the proposed changes. However, reception by the CHP was negative, with the party’s deputy leader Selin Sayek Böke claiming that the proposals essentially created a “sultanate“. Parliamentary group leader Levent Gök, one of the first to comment on the released proposals, claimed that the changes would revert 140 years of Turkish parliamentary democracy, calling on all parties to reject the proposals. Another of the CHP’s parliamentary group leaders, Özgür Özel, called the proposals a “regime change”, with the parliament being left essentially powerless in scrutinising ministers and holding them to account. Özel claimed that the AKP were unlikely to obtain the 330 votes necessary to put the changes to a referendum, stating that he would be surprised if the number of MPs voting in favour reached 275. CHP MP Selina Doğan claimed that the authoritarian nature of the proposals would effectively end Turkey’s EU accession negotiations, citing the lack of any relevance to European values. CHP MP Cemal Oktan Yüksel claimed that the proposals resembled the constitution of Assad‘s Syria, stating that it wouldn’t be a national constitution but “Syria’s constitution translated”. Despite having the nationalist MHP’s official support, it was reported that Turkish nationalists were also overwhelmingly critical of both the proposals and their party’s involvement in their drafting. Bahçeli, who has historically lent support to the AKP in controversial situations, was subject to criticism from all major parties for his decision to support the constitutional amendments, being described as the AKP’s “back garden”, “life-line” or “spare tyre” by critics. On 24 October 2016, 5 of the 40 MHP Members of Parliament declared that they would reject the constitutional proposals, against their party line. Ümit Özdağ, who was a leadership candidate against Bahçeli and one of the 5 MPs critical of the changes, had his party membership revoked in November. A poll released by Gezici in December showed that almost two-thirds of MHP supporters were against the proposed changes, though MHP supporters were also the most undecided amongst the other parties. On 27 December, MHP MP Kadir Koçdemir became the fifth MP from his party to publicly state his opposition to the proposals. Speaking shortly after the proposals were released, the HDP’s spokesperson Ayhan Bilgen criticised the proposed changes for being anti-democratic and against the principle of judicial independence. Citing the proposed creation of “executive orders” that can be decreed by the President at will without parliamentary scrutiny, Bilgen criticised the nature of the changes, calling them poorly written and an attempt to cover up constitutional violations that had taken place under the current constitution. However, on 18 December, HDP MP Kadri Yıldırım claimed that there would be no reason to reject the proposals if the changes included a separate “status” for Turkish Kurds and a constitutional entitlement to education for Kurdish citizens in their native Kurdish language. This led to speculation that the HDP could be convinced to support the changes by the AKP government, though the MHP would be unlikely to jointly support any changes that are also endorsed by the HDP. On 21 December, the CHP and HDP issued a parliamentary motion that would declare the proposals “unconstitutional”, but the motion was rejected by MPs. The changes have also received severe criticism from outside Turkey. One commentator went as far as to declare that “if a majority votes yes, this will be the end of parliamentary democracy in Turkey.”  The NGO Human Rights Watch stated that the changes were a “huge threat to human rights, the rule of law, and the country’s democratic future.” The Economist concluded that “a vote for Yes would saddle the country with an elected dictator.”  The Venice Commission of the Council of Europe, in its March 2017 Opinion on the Constitutional amendments, defined them as “a threat to democracy” and stressed the “dangers of degeneration of the proposed system towards and authoritarian and personal regime”. Also, before the vote took place, the openDemocracy website reported that some European news outlets published concerns that the 2017 referendum amounted to something like an “enabling act” for Erdogan. Ruling party AKP and opposition MHP are the signatories of the amendments. MHP has provided their conditional support until their conditions are met. Main opposition CHP’s initial position was to wait until the amendments were finalized. CHP leader Kılıçdaroğlu once mentioned of bringing the changes into Grand Assembly. Later, CHP decided to favor No vote and started “Türkiye’yi Böldürmeyeceğiz” (Turkish: We’ll not partition Turkey) rallies. Parliament’s fourth party HDP is against the changes. The ‘Yes’ campaign has been predominantly led by Justice and Development Party (AKP) politicians, as well as Nationalist Movement Party (MHP) politicians loyal to leader Devlet Bahçeli. Initially expecting a 7 February start to the campaign, the AKP eventually kicked off their official campaign on 25 February with a presentation by Prime Minister Binali Yıldırım at the Ankara sports stadium. Amid poor showings in opinion polls in February, Erdoğan reportedly asked pro-government pollsters to suspend their opinion polling until the end of March, while proposals for a joint electoral rally by both leading AKP and MHP politicians has also been proposed. The ‘Yes’ campaign has been criticised for its smear campaign against individuals voting ‘No’, associating them with numerous terrorist organisations. Prime Minister Binali Yıldırım claiming that they would vote ‘Yes’ because the Kurdistan Workers Party (PKK) and the so-called Fethullah Gülen Terrorist Organisation (FETÖ) were voting ‘No’, though both organisations have historically been in favour of an executive presidency. President Recep Tayyip Erdoğan also caused controversy when he claimed that those voting ‘No’ were siding with the coup plotters behind the 2016 Turkish coup d’état attempt. At present, the ‘Yes’ campaign has been conducted through electoral rallies held by Prime Minister Yıldırım, leading AK Party politicians and also President Erdoğan, who has held ‘public opening’ rallies similar to his tactics in the June 2015 general election. MHP leader Devlet Bahçeli has conducted conferences in favour of a ‘Yes’ vote, with the first occurring in Konya on 12 February 2017. On 10 March, the Great Union Party (BBP) led by Mustafa Destici announced that they would support a ‘Yes’ vote, bringing the total number of parties supporting ‘Yes’ to six. Both the BBP and MHP have suffered serious opposition to their support for a ‘Yes’ vote, with BBP members calling for Destici’s resignation following his announcement. The MHP suffered a wave of resignations, inner-party suspensions and a rival ‘No’ campaign run by high-profile nationalist politicians, with opinion polls indicating that a significant majority of MHP voters intend to vote against the proposals. Most polls put the percentage of ‘No’ voters in the MHP at between 50% to 80%, with definite ‘Yes’ voters remaining at 20-25%. Politicians supporting ‘No’ from both the MHP and BBP have claimed that over 95% of their party supporters are favouring a ‘No’ vote, breaking with their party’s executive decision. The CHP unveiled their campaign logo and slogan on 28 February, using the slogan ‘Geleceğim için Hayır’ (translating to No for my future). The party planned their first electoral rally in Amasya, though preliminary rallies were held by party leader Kemal Kılıçdaroğlu on 21 December 2016 in Adana and by dissident MP Muharrem İnce on 8 March 2017 at Zonguldak. CHP MPs also made a series of overseas visits to rally support from overseas voters, with former leader Deniz Baykal holding an event in France. High-profile dissident MHP politicians, such as Meral Akşener, Sinan Oğan, Ümit Özdağ and Yusuf Halaçoğlu all began a ‘No’ campaign based on Turkish nationalism, rivalling the MHP’s official ‘Yes’ campaign. The dissident ‘No’ campaign attracted significantly higher popularity than the MHP’s official ‘Yes’ events, with opinion polls indicating that an overwhelming majority of MHP voters intend to break the party line and vote ‘No’. In addition to the MHP dissidents, the Turkish Bars Association and its President Metin Feyzioğlu embarked on a nationwide tour, intending to meet with locals in numerous towns and villages to rally support for a ‘No’ vote. ‘No’ campaigners have faced alleged government-backed coercion and suppression. On 1 March, the main opposition Republican People’s Party (CHP) unveiled a 78-point report regarding irregularities and suppression of ‘No’ campaigners, with Deputy Leader Öztürk Yılmaz claiming that those who were campaigning for a ‘No’ vote faced fear and state coercion. CHP parliamentary group leader Engin Altay also criticised the government for using state funds to fund the ‘Yes’ campaign while repressing ‘No’ voters, claiming that their conduct did not allow them to talk of ‘democracy’. Allegations of electoral misconduct, irregularities throughout the campaign and state coercion of ‘No’ supporters were widespread in the run-up to the referendum. The AKP government and the General Directorate of Security (police) have both been criticised for employing tactics designed to limit the campaigning abilities of ‘No’ supporters, through arrests, control of the media and political suppression. On 23 January 2017, university students campaigning for a ‘No’ vote on a commuter ferry in İstanbul were implicated by security officers for ‘insulting the president’, with their arrests being stopped by onboard passengers. On 31 January, Republican People’s Party council member Sera Kadıgil was arrested and later freed on charges of ‘insulting religious values and inciting hatred’ for campaigning for a ‘No’ vote on social media. In Bursa, a voter who revealed that he was voting ‘No’ was reported to the police and later arrested. National television channels have been vastly in favour of the ‘Yes’ campaign. One study found that ‘Yes’ supporters received 90% of airtime. Municipalities held by pro-‘Yes’ parties have also sought to limit the campaign events of ‘No’ voters by denying them rights to hold rallies in public spaces of community halls. Meral Akşener, a leading nationalist politician and one of the most prominent campaigners for a ‘No’ vote, was stopped from holding speeches when her campaign venues in Yalova and Edirne were abruptly shut down shortly before her events, with posters advertising her events in Eskişehir being ripped down. On 11 February while she was making a speech at a hotel hall in Çanakkale, the venue suffered a power cut and was perceived by the pro-opposition media to be a symbol of the oppressive tactics against the ‘No’ campaign. After initially being obstructed by riot police, attendees at the conference used their iPhone lights to allow the event to continue. Overseas election campaigning, even in diplomatic missions, is illegal under Turkish law; yet most political parties in Turkey, including CHP and the ruling AKP, have flouted the law. In early March, pro-‘YES’ campaigners, including high-profile AK Party government ministers were barred from holding campaign events in Germany, Austria, Switzerland, Denmark and the Netherlands. In Germany, local municipalities withdrew permits for Justice Minister Bekir Bozdağ‘s campaign event in Gaggenau and Economy Minister Nihat Zeybekçi‘s event in Cologne. While authorities citied security concerns, the insufficient capacities of the rented venues and irregularities in the organisational process, the Turkish government strongly condemned the cancellations and claimed that they were directly linked to an anti-Turkish agenda of the German federal government. Turkish foreign minister Mevlüt Çavuşoğlu claimed that Germany had showed ‘double standards’ and a disregard for ‘human rights and freedom of speech’ by cancelling the events. Following a negative reaction by the German federal government to a proposed rally by Recep Tayyip Erdoğan, Erdoğan accused Germany of ‘Nazi-style tactics’, causing strong condemnation by German officials and a souring of diplomatic relations. The Turkish government also accused Germany of funding and supporting the Kurdistan Workers Party (PKK), which is designated as a terrorist organisation in both countries. Mevlüt Çavuşoğlu was due to meet his German counterpart on 8 March, with scheduled campaign speeches in Hamburg also being cancelled due to irregularities with the venues. Çavuşoğlu therefore made his speech in the Hamburg consulate, despite Turkish law forbidding election campaigns in diplomatic missions. The cancellations in Germany were met by condemnation from the main opposition and pro-‘No’ Republican People’s Party, with former leader Deniz Baykal cancelling a planned visit to Germany as a result. A diplomatic crisis occurred between Turkey and the Netherlands on 11 March, after Çavuşoğlu’s official plane had its permission to land revoked mid-air ahead of a scheduled campaign speech. Later that day, Families and Social Policy Minister Fatma Betül Sayan Kaya‘s convoy was stopped by Dutch police, which blocked her access to the Turkish consulate in Rotterdam. Kaya was later declared persona non grata, with a regional state of emergency being declared and her convoy being asked to leave the country. Kaya was therefore forced to return to Germany, while Çavuşoğlu left for France to attend another campaign event. Violent protests by Turkish expats broke out in Rotterdam following the expulsion of both ministers, with the police making 12 arrests. The Dutch government had previously asked Turkish ministers to refrain from campaigning in the country, fearing that divisive campaign rhetoric would sow divisions within the Turkish community. Prime Minister Mark Rutte claimed that negotiations with the Turkish government to allow a small scale speech by the minister were still ongoing, when Çavuşoğlu publicly threatened with sanctions should ministers be prevented from campaigning. It was these threats that made the situation unsolvable to the Dutch government. Many people in Turkey took the side of the Turkish government in the matter, with the pro-‘No’ main opposition announcing their support for the government and calling on the AKP to freeze diplomatic relations with the Netherlands. All CHP overseas campaign events were later suspended in solidarity, while the pro-‘No’ MHP dissident camp also expressed their condemnation against the Dutch government for their actions. In the Dutch parliament all parties, except for the two-seat Denk party, supported the decisions of the Dutch Government. Recep Tayyip Erdoğan reiterated his claim that European governments that suspended campaigning were ‘Nazi remnants’, which the Dutch government denounced as “unacceptable”. 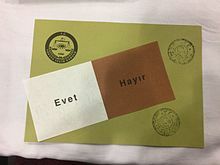 Supreme Electoral Council of Turkey lifted a rule that required each ballot to have an official stamp. Instead, it ruled that ballots with no stamp would be considered valid, unless there was proof that they were fraudulent. The opposition parties claim that as many as 1.5 million ballots without a stamp were accepted. Opposition parties CHP and HDP have said they will contest the results. CHP leader Kemal Kilicdaroglu said that lifting the rule violated Turkish law. According to Meral Akşener “No” votes win by 52 percent. Peoples’ Democratic Party contested the election results announced by pro-government Anadolu Agency and insisted that 1.5 million votes without valid stamps should be cancelled. Voting for Turkish expats abroad begins in 120 different overseas representations in 57 countries, as well as at customs gates. Overseas voting for Turkish expats takes place in 120 representations in 57 countries. United States – President Donald Trump called his Turkish counterpart to congratulate him on the victory. Russia – President Vladimir Putin called the Turkish President to extend congratulations on behalf of the Russian people. China – Chinese Deputy Prime Minister Liu Yandong, who was visiting Turkey at the time of the referendum, congratulated Erdogan and the Turkish people on the victory. Iran – Iranian Foreign Minister, Mohammad Javad Zarif, extended congratulations to his Turkish counterpart, Mevlüt Çavuşoğlu. Pakistan – President Mamnoon Hussain and Prime Minister Nawaz Sharif also congratulated Turkish people on the victory. Saudi Arabia – Saudi Arabia’s cabinet congratulated Erdogan and the Turkish people on the successful referendum of constitutional amendments. Azerbaijan – President Ilham Aliyev was the first international leader to call the Turkish President, saying that the result demonstrated “the Turkish people’s great support” for Erdogan’s policy. Qatar – Qatar’s Emir Tamim bin Hamad Al Thani also congratulated the Turkish President on victory. Palestinian Authority – President Mahmoud Abbas extended congratulations to the Turkish President. Iraq – Iraqi Vice President Osama al-Nujaifi sent a message to congratulate the Turkish President. Germany – Angela Merkel said the tight referendum result showed that Turkey is divided and reports over irregularities should be taken seriously. Peter Altmaier, Merkel’s chief of staff, said that Germany “respects a result that came about in a free and democratic vote”. France – President Hollande stated that the Turkish people have the right to decide how to organize political institutions, but the referendum results show that Turkey is divided about the reforms. Austria – Foreign Minister Sebastian Kurz said the result was a clear signal against the European Union and the fiction of Turkey’s bid to join the bloc must be ended. Nigeria – President Muhammadu Buhari has congratulated the people and government of Turkey on the successful conclusion of the country’s referendum. Kazakhstan – President Nursultan Nazarbayev sent a telegram of congratulations to Erdoğan. Georgia – Prime Minister Giorgi Kvirikashvili congratulated Turkey on the referendum results and remarked that Turkey’s stable development was important to Georgia. Cyprus – Government spokesman Nicos Christodoulides said that Cyprus hopes Turkey’s stance will move the peace talks forward toward the stated goal of reunifying the island as a federation. Belarus – President Alexander Lukashenko congratulated Turkey on the successful referendum. European Union – The Spokesman for European Commission President, Jean-Claude Juncker, expressed concerns over allegations of irregularities in the referendum and called on Turkish civil authorities to launch transparent investigations into the claims. The Patriotic Party (Turkish: Vatan Partisi, Vatan Partisi) is a left-wingpolitical party in Turkey. The Patriotic Party describes itself as “vanguard party“ and aims that bring together socialists, revolutionaries, nationalists and Kemalists. The party was originally founded in 1992 as Workers’ Party. In 2015, after a long-time political repositioning period, the Workers’ Party changed its name to “Patriotic Party” during the extraordinary congress. Like the Workers’ Party, the Patriotic Party is led by Doğu Perinçek. The party’s founding members include former army generals who had been incriminated during theErgenekon trials and the Sledgehammer case. The party’s Turkish name Vatan directly translates to Motherland orHomeland, however the party has adopted the English name Patriotic Party. This is most likely in order not to clash with parties that have a similar name when translated to English, such as the Motherland Party (Anavatan Partisi) or the Homeland Party (Yurt Partisi). Patriotic in Turkish translates to Vatanseveror Yurtsever. The party’s official short name (abbreviation) is Vatan Partisi, i.e. the same as the name of the party itself. Colloquially the acronym VP is used.